Sumatra produces some of the most striking and recognizable profiles in the coffee world: earthy, full and packed with cedar and spice. While most people are familiar with Mandehling and Gayo, fewer have explored the type known as “Lintong,” which takes its name from its home in the District of Lintongnihuta. 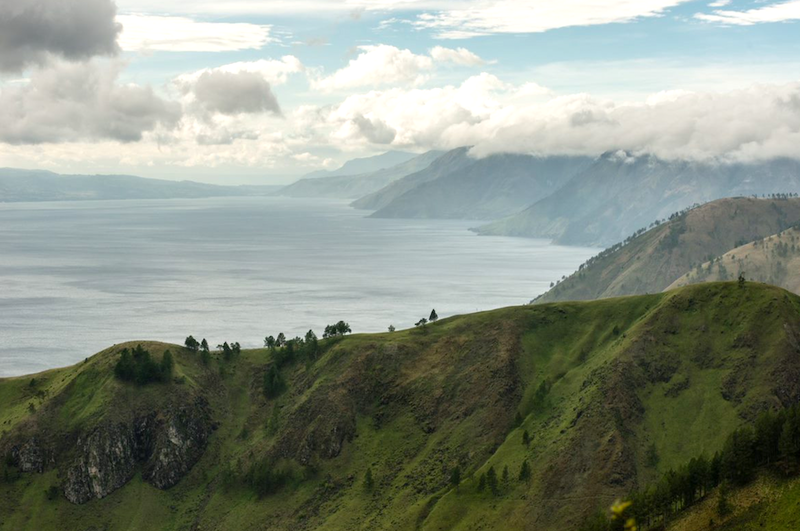 This region lies southwest of Lake Toba (pictured), which is one of the world’s deepest inland bodies of water. The Lintong region rises to a high plateau, providing the altitude necessary for Arabica cultivation. A unique method used in production results in a very full body with a concentrated flavor, garnished with herbal nuances and a spicy finish. Giling Basah, the traditional Sumatran method of processing coffee, involves hulling the parchment off the bean at roughly 50 percent moisture content, versus the 10 to 12 percent moisture level that's common in most other regions. This unique process results in a distinctive flavor profile: a full body, low acidity, spicy, herbal and chocolate flavor notes, and a richness that lingers on the back of the palate. The Grade 1 Triple-Picked distinction is, as one might guess, hand sorted three times, which results in a very consistent cup that includes only perfectly ripe fruit. High-quality Lintongs differentiate themselves from other Sumatran coffees with their clean mouthfeel and particularly bright acidity. Compared to Mandehlings, Lintongs also have a medium body, while still retaining notes of dark chocolate and fresh earth. Clean, consistent, bright acidity; notes of earth, florals, soft tobacco and spice.